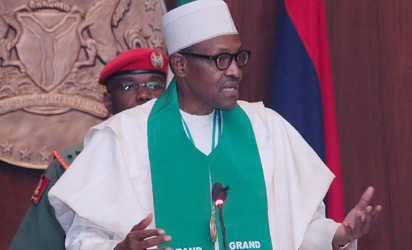 ABUJA – PRESIDENT Muhammadu Buhari on Monday gave reasons why the Nigerian Army was not hard on the separatist agitation of Biafrans during the 30 months civil war. President Muhammadu Buhari addresses the delegation after his Investiture as grand Patron by Nigerian Red Cross Society during a courtesy visit held at the Council Chamber State House in Abuja. President Muhammadu Buhari addresses the delegation after his Investiture as grand Patron by Nigerian Red Cross Society during a courtesy visit held at the Council Chamber State House in Abuja. President Buhari explained that they had strict and formal instructions to exercise restraint against Biafrans during the three-year civil war which took place between1967-1970. The President recalled that every military commander was issued the instructions in dispatches handed to them from the then Head of State, General Yakubu Gowon, that the Biafrans, were not enemies but brothers and sisters of the rest of Nigerians. President Muhammadu Buhari addresses the delegation after his Investiture as grand Patron by Nigerian Red Cross Society during a courtesy visit held at the Council Chamber State House in Abuja. President Buhari explained that they had strict and formal instructions to exercise restraint against Biafrans during the three-year civil war which took place between1967-1970. The President recalled that every military commander was issued the instructions in dispatches handed to them from the then Head of State, General Yakubu Gowon, that the Biafrans, were not enemies but brothers and sisters of the rest of Nigerians. President Buhari stated this at the Presidential Villa, Abuja during his investiture as Grand Patron of the Nigerian Red Cross Society (NRCS). The President who promised to assist the organisation secure permanent office accommodation in Abuja, showered praises on the former Head of State, Gen. Gowon, retd, for that gesture and also the role of the Red Cross in bringing succour to victims of the war even in dangerous circumstances. He went memory lane over the horrible consequence of the civil war, noting that the pathetic pictures of war-ravaged Biafrans were always heartrending. According to him, “Earlier in my profession, during the civil war, I know how much sacrifice members of the Nigerian Red Cross and their international counterparts did both in the real front of operations and at the rear, on both sides. I think it is a lot of sacrifices because anything can happen to you in the operational areas. “The risks they faced were real and I admire their courage and commitment to helping people who were in distress and were virtually in millions. Those photographs of people from the Biafra enclave spoke a lot. “I remember with nostalgia the performance of the Commander-in-Chief, General Gowon. Every commander was given a copy of the Commander-in-Chief’s instructions that we were not fighting enemies but that we were fighting our brothers. And thus, people were constrained to show a lot of restraint. “The international observer teams were allowed to go as far as possible within and outside the front and I think this was generous and very considerate of General Gowon. He is a highly committed Nigerian.” On his promise to assist the organisation secure permanent office accommodation in Abuja, Buhari said, “I have taken note of your logistics especially your(request for) office here. “I assure you that the government will do its best when you decide to build such facilities in terms of securing an area here within the Federal Capital Territory and we hope you will not do the Nigerian ways of doing things. “To use the words of famous Nigerian Minister `I hope you will not build an elephantine headquarters’ which is going to be functional because we have seen your activities throughout the country,” he said. In his remarks, the head of delegation and National President of the NRCS, Chief Bolaji Anani, said the organization has over 800,000 trained volunteers based in communities across the 774 local government areas of the federation. Anani pleaded with the President to assent to the Bill amending the Red Cross Act of 1960, whenever the National Assembly, which was currently debating on it, eventually passes it, noting that the Act has not been reviewed since it was passed in 1960. He said, “A review is long overdue. We note with pleasure that the current National Assembly is in the process of doing that. In fact, the revision has already undergone public hearing. “We hope when the revised Bill is passed by the national assembly it will be to be graciously assented to by Mr President.” He also appealed to President Buhari to restore federal government’s grants, subventions and programme support to the society to enable it discharge its mandate diligently. The Red Cross boss demanded for operational vehicles for ease of the work of the Red Cross in Nigeria; restoration of annual grants from the Federal Government; and special government recognition and awards to Red Cross officials and volunteers who have exceeded in service or even paid the intimate price in service to the fatherland and humanity, in a bid to motivate more humanitarian gestures. He further lamented that the Nigerian Red Cross has been operating from rented premises since it moved its headquarters from Lagos to Abuja, so inadequate space to store relief materials and equipment. The NCRS is the Nigerian arm of the global humanitarian Red Cross and And Red Crescent Movement which is present in over 193 countries and has played a major role in providing relief materials to beleaguered and starving Biafrans during Nigeria’s civil war when the Southeast and South-South parts of the nation sought to break away to form an independent country. President Muhammadu Buhari addresses the delegation after his Investiture as grand Patron by Nigerian Red Cross Society during a courtesy visit held at the Council Chamber State House in Abuja. President Buhari explained that they had strict and formal instructions to exercise restraint against Biafrans during the three-year civil war which took place between1967-1970. The President recalled that every military commander was issued the instructions in dispatches handed to them from the then Head of State, General Yakubu Gowon, that the Biafrans, were not enemies but brothers and sisters of the rest of Nigerians. President Buhari stated this at the Presidential Villa, Abuja during his investiture as Grand Patron of the Nigerian Red Cross Society (NRCS). The President who promised to assist the organisation secure permanent office accommodation in Abuja, showered praises on the former Head of State, Gen. Gowon, retd, for that gesture and also the role of the Red Cross in bringing succour to victims of the war even in dangerous circumstances. He went memory lane over the horrible consequence of the civil war, noting that the pathetic pictures of war-ravaged Biafrans were always heartrending. According to him, “Earlier in my profession, during the civil war, I know how much sacrifice members of the Nigerian Red Cross and their international counterparts did both in the real front of operations and at the rear, on both sides. I think it is a lot of sacrifices because anything can happen to you in the operational areas. “The risks they faced were real and I admire their courage and commitment to helping people who were in distress and were virtually in millions. Those photographs of people from the Biafra enclave spoke a lot. “I remember with nostalgia the performance of the Commander-in-Chief, General Gowon. Every commander was given a copy of the Commander-in-Chief’s instructions that we were not fighting enemies but that we were fighting our brothers. And thus, people were constrained to show a lot of restraint. “The international observer teams were allowed to go as far as possible within and outside the front and I think this was generous and very considerate of General Gowon. He is a highly committed Nigerian.” On his promise to assist the organisation secure permanent office accommodation in Abuja, Buhari said, “I have taken note of your logistics especially your(request for) office here. “I assure you that the government will do its best when you decide to build such facilities in terms of securing an area here within the Federal Capital Territory and we hope you will not do the Nigerian ways of doing things. “To use the words of famous Nigerian Minister `I hope you will not build an elephantine headquarters’ which is going to be functional because we have seen your activities throughout the country,” he said. In his remarks, the head of delegation and National President of the NRCS, Chief Bolaji Anani, said the organization has over 800,000 trained volunteers based in communities across the 774 local government areas of the federation. Anani pleaded with the President to assent to the Bill amending the Red Cross Act of 1960, whenever the National Assembly, which was currently debating on it, eventually passes it, noting that the Act has not been reviewed since it was passe in 1960. He said, “A review is long overdue. We note with pleasure that the current National Assembly is in the process of doing that. In fact, the revision has already undergone public hearing. “We hope when the revised Bill is passed by the national assembly it will be to be graciously assented to by Mr President.” He also appealed to President Buhari to restore federal government’s grants, subventions and programme support to the society to enable it discharge its mandate diligently. The Red Cross boss demanded for operational vehicles for ease of the work of the Red Cross in Nigeria; restoration of annual grants from the Federal Government; and special government recognition and awards to Red Cross officials and volunteers who have exceeded in service or even paid the intimate price in service to the fatherland and humanity, in a bid to motivate more humanitarian gestures. He further lamented that the Nigerian Red Cross has been operating from rented premises since it moved its headquarters from Lagos to Abuja, so inadequate space to store relief materials and equipment. The NCRS is the Nigerian arm of the global humanitarian Red Cross and And Red Crescent Movement which is present in over 193 countries and has played a major role in providing relief materials to beleaguered and starving Biafrans during Nigeria’s civil war when the Southeast and South-South parts of the nation sought to break away to form an independent country. ABUJA – PRESIDENT Muhammadu Buhari on Monday gave reasons why the Nigerian Army was not hard on the separatist agitation of Biafrans during the 30 months civil war. President Muhammadu Buhari addresses the delegation after his Investiture as grand Patron by Nigerian Red Cross Society during a courtesy visit held at the Council Chamber State House in Abuja. President Buhari explained that they had strict and formal instructions to exercise restraint against Biafrans during the three-year civil war which took place between1967-1970. The President recalled that every military commander was issued the instructions in dispatches handed to them from the then Head of State, General Yakubu Gowon, that the Biafrans, were not enemies but brothers and sisters of the rest of Nigerians. President Buhari stated this at the Presidential Villa, Abuja during his investiture as Grand Patron of the Nigerian Red Cross Society (NRCS). The President who promised to assist the organisation secure permanent office accommodation in Abuja, showered praises on the former Head of State, Gen. Gowon, retd, for that gesture and also the role of the Red Cross in bringing succour to victims of the war even in dangerous circumstances. He went memory lane over the horrible consequence of the civil war, noting that the pathetic pictures of war-ravaged Biafrans were always heartrending. According to him, “Earlier in my profession, during the civil war, I know how much sacrifice members of the Nigerian Red Cross and their international counterparts did both in the real front of operations and at the rear, on both sides. I think it is a lot of sacrifices because anything can happen to you in the operational areas. “The risks they faced were real and I admire their courage and commitment to helping people who were in distress and were virtually in millions. Those photographs of people from the Biafra enclave spoke a lot. “I remember with nostalgia the performance of the Commander-in-Chief, General Gowon. Every commander was given a copy of the Commander-in-Chief’s instructions that we were not fighting enemies but that we were fighting our brothers. And thus, people were constrained to show a lot of restraint. “The international observer teams were allowed to go as far as possible within and outside the front and I think this was generous and very considerate of General Gowon. He is a highly committed Nigerian.” On his promise to assist the organisation secure permanent office accommodation in Abuja, Buhari said, “I have taken note of your logistics especially your(request for) office here. “I assure you that the government will do its best when you decide to build such facilities in terms of securing an area here within the Federal Capital Territory and we hope you will not do the Nigerian ways of doing things. “To use the words of famous Nigerian Minister `I hope you will not build an elephantine headquarters’ which is going to be functional because we have seen your activities throughout the country,” he said. In his remarks, the head of delegation and National President of the NRCS, Chief Bolaji Anani, said the organization has over 800,000 trained volunteers based in communities across the 774 local government areas of the federation. Anani pleaded with the President to assent to the Bill amending the Red Cross Act of 1960, whenever the National Assembly, which was currently debating on it, eventually passes it, noting that the Act has not been reviewed since it was passe in 1960. He said, “A review is long overdue. We note with pleasure that the current National Assembly is in the process of doing that. In fact, the revision has already undergone public hearing. “We hope when the revised Bill is passed by the national assembly it will be to be graciously assented to by Mr President.” He also appealed to President Buhari to restore federal government’s grants, subventions and programme support to the society to enable it discharge its mandate diligently. The Red Cross boss demanded for operational vehicles for ease of the work of the Red Cross in Nigeria; restoration of annual grants from the Federal Government; and special government recognition and awards to Red Cross officials and volunteers who have exceeded in service or even paid the intimate price in service to the fatherland and humanity, in a bid to motivate more humanitarian gestures. He further lamented that the Nigerian Red Cross has been operating from rented premises since it moved its headquarters from Lagos to Abuja, so inadequate space to store relief materials and equipment. The NCRS is the Nigerian arm of the global humanitarian Red Cross and And Red Crescent Movement which is present in over 193 countries and has played a major role in providing relief materials to beleaguered and starving Biafrans during Nigeria’s civil war when the Southeast and South-South parts of the nation sought to break away to form an independent country.